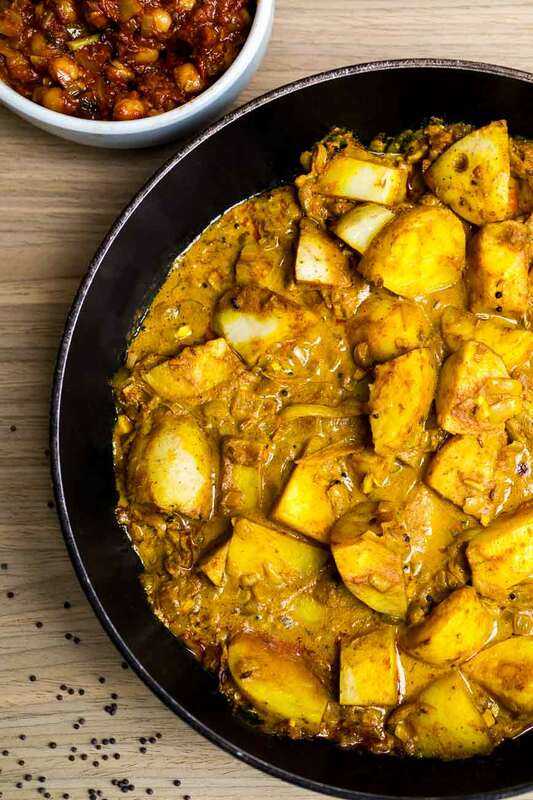 A few years ago, while learning how to cook at university, I realised that to make many curries you follow more or less the same sequence of steps. Once memorised, that sequence became super helpful to me. 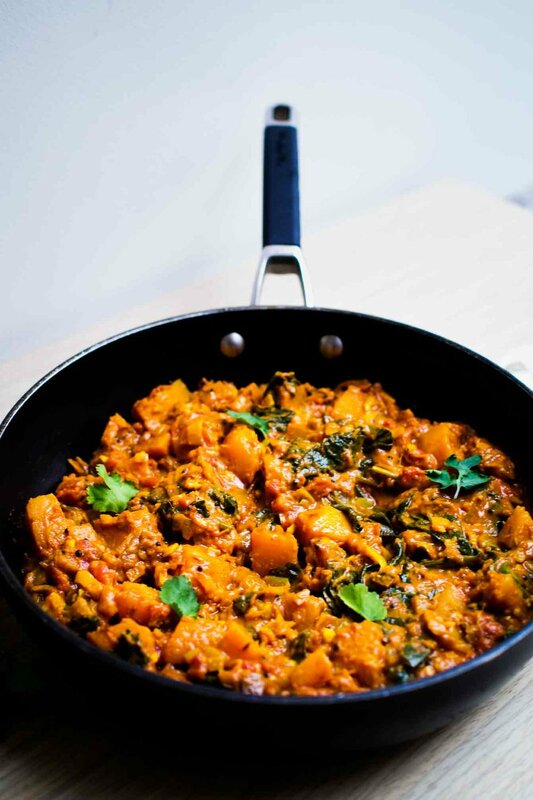 I was able to quickly and efficiently produce a healthy, filling curry without a recipe or too much thought. So in today's post I'm going to show you this sequence in the form of a flowchart. The graphic illustrates how to make a base, then spice it, add your 'bulk' ingredients, then garnish and season - and it's adaptable and all in one pot. What more could you want?! On this page you'll see three curries I made using this sequence: coconut-potato, tomato-chickpea and coconutty-tomatoey butternut squash. In addition, I've written up the usual fully detailed recipe (for the pedants out there :P) below the flowchart. Make sure to right-click the flowchart and choose Save Image As.. so you can refer back to it later! Please bear in mind that when I say 'curry', I do not seek to simplify the whole of India's cuisine. 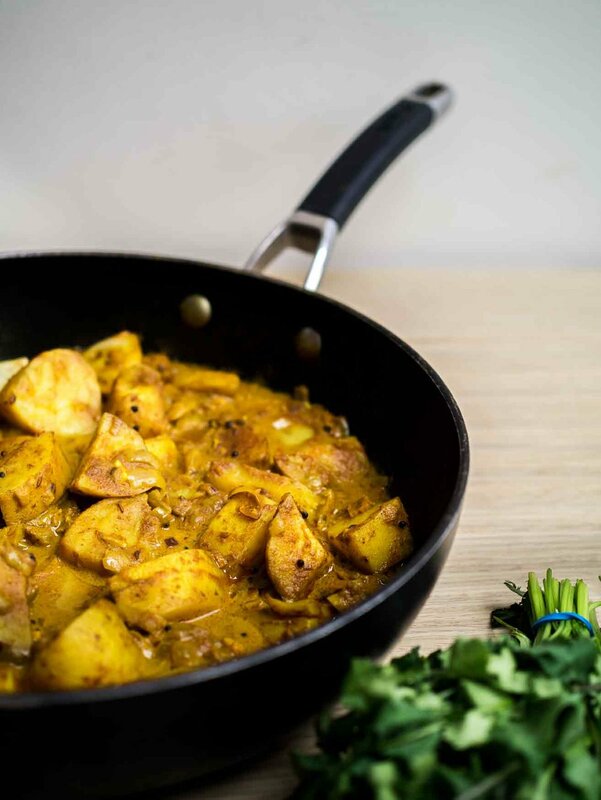 I use the word curry as an indication that the resultant dish will be a central, often carby, ingredient such as potatoes or legumes, cooked in a sauce spiced with the likes of cumin, turmeric and chilli powder. That is what the term 'curry' means in Britain: merely a helpful indicator to the nature of the dish. In fact, on reading up, it seems in India the term curry doesn't even exist; it is an anglicism, exported during the British occupation of India. 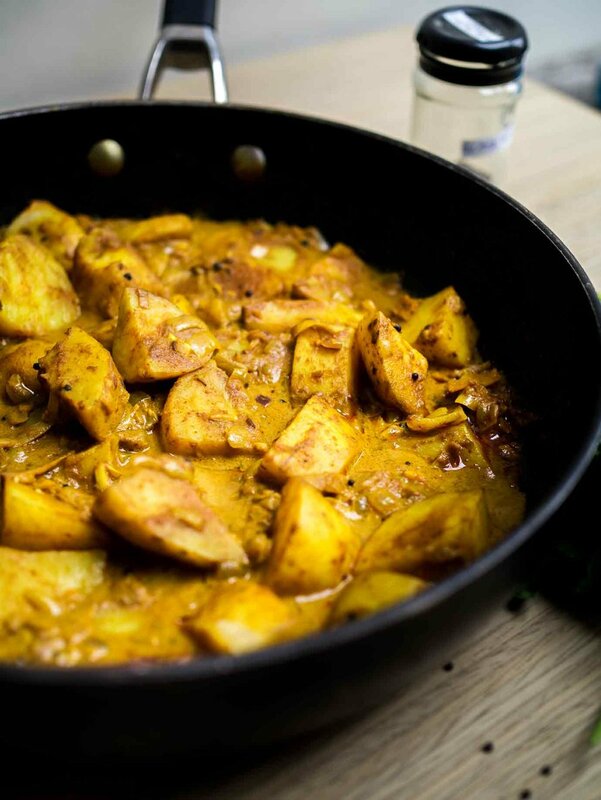 I've grown to love the curry 'sequence': it's such fun to cook. Black mustard and cumin seeds fried until they pop. Onions, ginger and garlic added and sweated till soft. In with the 'big four': ground cumin, coriander, turmeric and chilli powder. Wonderful aromas fill the kitchen. Next up, coating the bulk ingredient in the spiced base. Chickpeas, potatoes, butternut squash, lentils - all work well. Now the liquid: I've found the perfect combination is one tin of chopped tomatoes plus half a can of light coconut milk and a scant cup of water. It produces a vibrant orange hue; slightly sweet, slightly acidic and not too rich. This can be reversed for a more coconutty curry – ½ can tomatoes to a whole can of the coconut milk. Stirring through some spinach or kale at the end adds a contrast in colour, texture, and a healthy touch. Seasoning with salt and lemon juice will bring everything to life. I always season food with salt and acid and usually skip the pepper; it's a spice in itself and its flavour doesn't always go well. A final sprinkle of garam masala adds one last waft of Indian spice. Garam masala – a mix of cinammon, cardomom, cloves, bay leaves and cumin (sometimes other spices, too) – is best added at the end of cooking. The initial spices have by now imparted their flavour but lost their fresh aroma; seasoning with garam masala solves this. Finally, to garnish: fresh coriander for its slightly zesty, herbal flavour. Phew! That was a lot of chat about curry. Do let me know if you find the graphic useful. You'll find the full recipe just below it. I really hope you enjoy using this sequence, and even expand on it! OR ½ a butternut squash, peeled and cut 1 inch dice, parboiled (see step 6). OR 3 medium baking potatoes, cut into 1 inch cubes, parboiled (see step 6). In a large pot or casserole dish, heat the oil over a high heat. Fry the black mustard and cumin seeds until the mustard seeds start to pop, about 1-2min. Turn the heat down to medium and add the onions. Sweat them for 5 minutes. Now add the ginger and garlic. Fry for another 5 minutes. Stir in the ground cumin, ground coriander, turmeric and chilli powder. Cook for another 5 minutes. Add your bulk ingredient. If using potatoes or butternut squash, steam or boil them for about 5-8 minutes to parboil them. 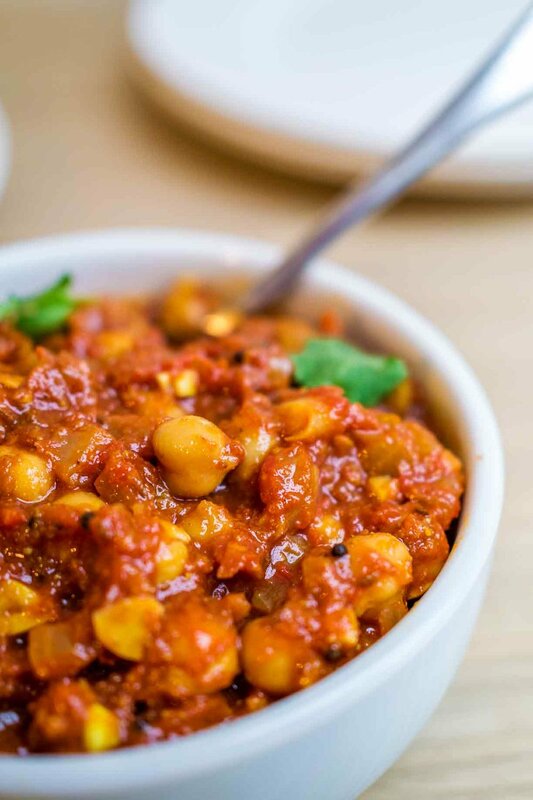 Add your choice of liquid: for a tomatoey curry use 1 can tomatoes + ½ can light coconut milk or for a coconutty one the other way around. Then add ½ can water. Bring to a boil, then turn down the heat and simmer for 15 minutes. Stir in the spinach or kale until it wilts (a few min). Check to see if your potatoes, butternut squash or lentils are well cooked. Sprinkle over the garam masale and season with salt and lemon juice to taste. 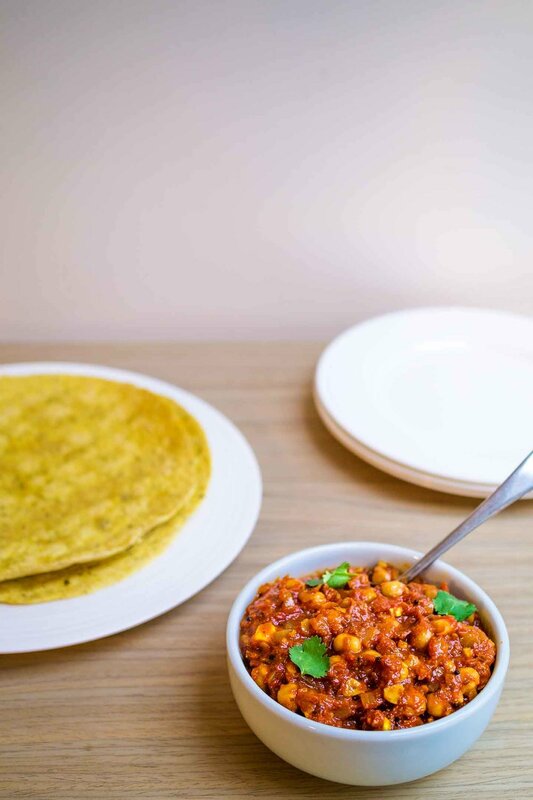 Garnish with fresh coriander leaves and serve with rice, naan bread or roti.